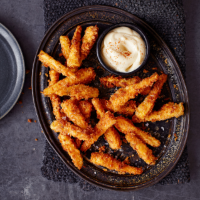 One for people who think they don’t like parsnips – the crunchy overcoat of mustard and crumbs will change their minds. 1. Cut the parsnips into tapering fingers about 8cm long and 1cm wide at their fattest end. Steam for 10-12 minutes, until soft all the way through but still holding their shape. Remove and set aside. 2. Mix 1 tbsp mustard with the mayonnaise until combined. Sprinkle with the pinch of cayenne, cover and chill. In a mixing bowl, stir together the remaining 1½ tbsp mustard with the garlic and thyme leaves. Gently fold the parsnips through the mixture until coated. 3. Spread the flour on a plate and season with the ½ tsp cayenne and salt. Put the eggs on a second plate and the panko on a third. In batches, toss the parsnips in the flour, shaking off the excess, then dip first in the egg, then the panko, ensuring they are well coated. 4. Pour a 1cm depth of oil into a solid frying pan and heat to 180°C (a cube of bread should brown in 40 seconds), or use a deep-fat fryer. Cook the parsnip fingers, in batches, for 30-40 seconds on each side, or until crisp and golden brown. Drain on kitchen paper, dust with salt, then serve warm with the mustard mayo.